Gwen introduces her first quilt, made soon after joining a quilt group in 1989 for a charm quilt exhibition. She sees herself as a traditional quiltmaker and talks about her family including previous generation’s links to quilting and passing on her skills and her stash to the next generation. Later Gwen talks about Project Linus quilts for children and explains terms such as wholecloth, quilting hoops and itinerant quilters, and why you would freeze a heritage quilt. Binkie Thomas [BT]: Gwen could you tell me about your quilt please? Gwen Jones [GJ]: Well, [clears throat] this is the first quilt I ever made. I joined a local group in 1989, yes, that’s right 1989, to be told that they had an exhibition in 18 months’ time and that the focus of the exhibition would be charm quilts. Now, that meant nothing to me at all, so I had to find out exactly what a charm quilt was and a charm quilt is a quilt where you can have one shape, it can be anything, a square, a triangle, a diamond, as long as it is just the one shape and every single piece in that quilt, every single patch in that quilt has to be a different fabric. You must not repeat your fabric anywhere in the quilt. Well, we all had to take our scraps in and swap around and take home bits and being a complete beginner, ignorant and not quite knowing where I was coming from I thought that the easiest things to sew together would be squares. So I cut all my pieces into squares and tacked them onto papers, which is what we did in those days, everything was done over papers and, um, carried on from there. And when it came to hanging the quilts in 18 months’ time from there, when I saw what the others were putting up I felt utterly and totally mortified, because there were diamonds in fantastic blocks, there were triangles which had been put together in such a way and mine was just plain squares in rows. So I wanted to take it down and hide it somewhere, but they wouldn’t let me. Now the group I had joined was a non-teaching group and I have got the feeling that if they had known that I was a complete and utter beginner, I’d sewn clothes all my life, but nothing to do with patchwork and going from a 5/8th inch seam when sewing clothes to a ¼ inch in patchwork was quite something. And had they known I was such a beginner, I don’t think they would have let me join because they were a non-teaching group. But I kept my eyes and my ears open and my mouth shut and managed to progress. And then, a few years later, I was a founder member of another group which was supposed to be an umbrella group for the whole of Gwent and in trying to promote our group we, erm, found an empty shop which the owners let us borrow. And we had put our quilts on show there and we could talk to passers-by and while I, my quilt happened to be one of the quilts that was there, and while I was there one day an art master came in with his class, and he said some very nice things about my quilt. About the way the colour had been done and the progression and everything and I did feel a lot better about my quilt after that, but I can still remember that day, when the quilts went up and mine was the poor relation. But the grandchildren love it because it‘s cuddly and fluffy… and it’s getting on a bit now. BT: Can you describe the quilt Gwen, the colours and the patterns, you’ve told us about the squares. What’s the filling in it? GJ: The filling in it is a 6 inch wadding. And because I hadn’t got time to quilt it, in those days, you didn’t machine quilt, you hand quilted everything, and by the time I’d managed to get this together there was no time for me to be able to hand quilt it. So I put a thick wadding in it, a 6 inch wadding, and I tied it, which has made it very nice and cuddly. BT: Well it is certainly lovely to feel. How do you use the quilt and what plans do you have for it. GJ: On the bed. It was on the bed at the beginning, and on our bed to start with and then it went to the grandchildren’s bed because they liked it so much. It’s been used as a tent, with the grandchildren playing with it. It’s been used for all sorts of things but at the moment for the last couple of years it’s been sitting on the shelf in the box room because I have got other quilts on the beds now, which are more attractive than this particular one, but I shall always think about it because it lead me to where I am now. If I hadn’t joined that group I wouldn’t have become a quilter I don’t think. BT: So this quilt is very important to you. GJ: It is rather, yes. BT: So when did you first start making quilts Gwen. GJ: This was the first one and everything we did in those days was done over papers and we had a fellow who came round twice a year and we called him The Tritex Man and you could buy strips of Liberty fabric for next to nothing and that was the first thing we all went for when we went to see him. So way back in those days when I first started we all made Liberty quilts and I have got a cot quilt which I made as a nine patch which I hand quilted as well, and in trying to sort out my sewing room the other day I have now found the blocks of a double nine patch which the… the block is nine inches square so each little Liberty nine patch is three inches square which means inch square little pieces… is all done over papers and I think that my next project, now that I have found it is to put all that together into a bed quilt. And I shall have to hand quilt that because the rest of it is all hand done. BT: I’m interested in this term over papers. I’m, familiar with the hexagons on papers, but what about squares, is this the same principle? GJ: Yes. Yes, you cut all your papers to the shapes you want and every single block we used to make in those days, it’s what they call English paper piecing isn’t it? As opposed to the American way or the French way where they just trace round the template and you sew on the pencil line or the marked line without using papers. But I have got one finished cot quilt like that, I also made a bed quilt over papers and that was squares again 25 squares to a block and 25 blocks in a quilt and that was all done by hand over papers and it sat around for a long time and then I layered it all up one day ready to hand quilt it and came home that evening to a phone call from my daughter saying that she had just got engaged and they wanted to get married in July which was three months after I had put the quilt together. So the quilt went into a box under the bed because I had much, too many other things to do plus one daughter who was expecting number three and was also packing up the house to move to Japan and it must have been years later that that quilt came out from under the bed and I took one look at it and I thought ‘Oh, I’m going to have this longarm quilted’ and I think that was the biggest mistake I ever made. It’s beautifully done but I look at it and think “You did all the rest of it over papers and you should have hand quilted it. BT: How long did it take you to do the hand bit over papers? GJ: Not that long in those days because, you know, you were used to it and you’d carry it about, I’d carry it about with me, that’s the trouble with the machine quilt, when you do things with the machine, you can’t carry the machine about with you, you can’t take it to the doctor’s surgery or to the hospital waiting room or anything like that. Whereas, when we did this over papers the little bundle of blocks went with you and you just stitched them down wherever you happened to be. BT: Mmm… Are there any other quiltmakers in your family, Gwen? 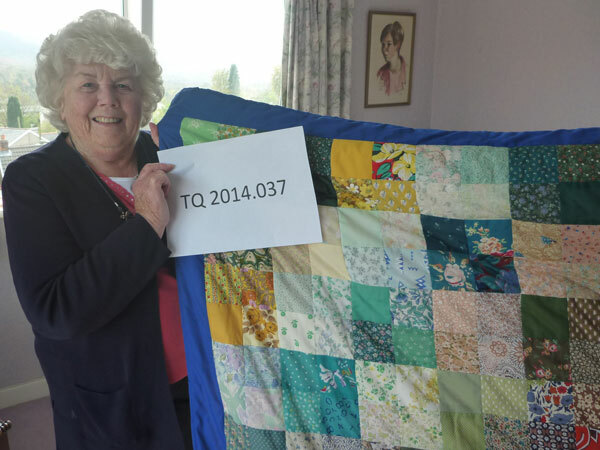 GJ: Not before me but my granddaughter has just started, has just finished putting her first quilt together and my daughter when she first got married did quite a fair amount, but then life and moves took over, but she is now going to start again to take it on. BT: And what are your preferred styles or techniques in quilting? GJ: I’m a traditionalist. I like quilts to go on beds and not to be hanging on walls and I am a piecer as opposed to an appliquér really. I’m not that keen on, but I have got a quilt I’d like to make and I intend I’m going to try machine applique on it but whether I will ever get around to that I don’t know. BT: So what do you enjoy about quiltmaking and what don’t you enjoy about quiltmaking? GJ: I think what I enjoy most is seeing the thing develop as you are progressing. Seeing the pattern build up, seeing how it is going to work out in the end. What I don’t like is choosing the colours. I am not very confident about choosing colours. I am very hesitant and think ‘Ooh is that right, is that wrong, is that right’. I tend to be, to allow myself to be too influenced by other people. I remember going into a shop once with a pattern I wanted to make and came out not with the colours I had intended to buy but with the ones that the shopkeeper liked. I never really finished that. I think I gave the finished top away for somebody else to finish. But… it’s erm… I don’t know, it’s the joy of having it finished. A lot of my quilts are longarm quilted because I have a friend in France who happens to be the first ever longarm quilter in France and she now, since I first met her she’s moved to a place where they have a gîte which they rent out. Now whenever I want to go to that gîte she won’t let me pay for it, but she will let me pay for longarming my quilts, so I tend to turn up there with three or four tops that I can pay her to longarm and then I don’t feel so guilty about staying in her gîte for free, especially as she tends to feed us every other night while we are there because she enjoys the company. BT: Sounds lovely. I wish I had a friend like that [chuckles]. What technology do you use Gwen when you are quilting, if any, but I know that you are computer literate? GJ: Um, I’ve got Electric Quilt, I’ve got Electric Quilt on my computer and if I want to see how a pattern looks I will do it up on that and I do that a lot in order to find out exactly how much yardage I need for things, because that will tell me, if I want an Ohio Star quilt, for example, in three colours and I wanted a single bed size, it will tell me how much fabric I need. Or if I wanted a double bed size it will also tell me, and I find that very handy. I look at patterns on the internet, don’t necessarily use them and I look in magazines. I have a tendency, I have a nasty habit of buying too many books, but I am now learning and getting rid of some of them. And I think I’ve found, no I haven’t, I thought I had found two patches the same next to each other in my quilt that’s on my lap. BT: As we’re speaking Gwen is stroking her quilt and looking at it very closely. It’s a very comforting quilt and I can understand why she does that. So where and when to you quilt Gwen? GJ: At my group which is an all-day meeting two days a month and I quilt there, in my sewing room during the day. Sometimes, when I’ve got hand stitching, in front of the television when I’m sitting with my husband in the evening. [Pauses] And I will take hand stitching with me if I go to another group. I’ m not really into going to workshops and the few workshops that I have been to I still haven’t finished what I started there, which is very wrong really, but I find that going to a workshop teaches you a technique maybe that you haven’t come across before and which you think is interesting. I’ve been to a couple of workshops with American Quilters. Helen Kelly, the late Helen Kelly who used to write an article every month in Quilters’ Newsletter came to a Quilters’ Guild AGM in Weymouth way back in the 1990s and I did a workshop with her. On one of my trips to America I did a workshop with Judy Matheson. And I go to lectures a lot when I’m away or if l’m… and I like listening to visiting speakers when I go to any Regional Day or Area Day in this country and seeing their quilts and what they’ve done, come home inspired. Um, yes, so I’m not really a workshop person. I’ve given workshops of my own before today, but I haven’t done that for a long time now. BT: So how do you go about making a quilt? GJ: I see a pattern or I have a pattern in my head that I’ve seen before for a long time. I sit down and work out how much fabric I need. I look and see if I’ve got that fabric already in the house otherwise I go out and buy it. There was a time when I used to wash all my fabrics first but I don’t do that anymore unless it’s red, but I do wash the reds, or test the reds to make quite sure that they don’t run. Umm and then I start cutting it… pardon me… cutting it up and sewing it. BT: Have you got a large stash? GJ: I have got a very, very large stash which my granddaughter is helping me sort out… um, some of it I am giving to her so that she can sell it to pay her way through University. She has also told me that I must not buy any more fabric because I have got more than I need already and that I must finish all my UFOs before I start anything new. And she’s quite funny about it all and she’s amazed by the amount of fabric I have, so am I now when we’re sorting through it. BT: And how much time do you actually spend making things? GJ: It all depends… um… some weeks I do very little sewing, other weeks I am sewing all the time. I did at one time, and I have learnt now not to do it anymore, to say no, I used to join in swaps with other groups in this country and in other countries which meant you had a deadline and you had to make so many blocks for that deadline, well then I would be sew, sew, sew, sew, sew and then when the blocks came back I have to admit that some of them were never put together into quilts. I have put some of them into quilt tops and they’ve been quilted, so it all depends. I find I don’t sew quite as much these days. GJ: No not every day, no. I would like to be able to do it but life gets in the way sometimes. GJ: Well, at the moment I’m spending very little. Most of my, you know, and because I have said, I have got so much, but if I haven’t got the wherewithal in the house to make what I want to make I find something else to do. I make… I find a different idea, then, let’s put it that way, so that I can do it that way and use up the fabric that I have got. Um and I am tending these days to do much simpler designs, they’re quicker to put together. I’ve been making a lot of quilts for Project Linus, some are finished and donated, some are still quilt tops needing to be quilted but I do that on my own machine, sort of straight lines or wavy lines or something like that. Very simply quilted. Um, I have quite, I have got some tops partly done which need finishing and they come in different sizes so there again if you want to make an incubator quilt you don’t need a lot of fabric to make that. BT: So could you just explain what Project Linus is? GJ: Project Linus is something which started in America where people make quilts for underprivileged children. In America I think, police cars, ambulances, fire engines, they all carry quilts with them which can be given on the spot to a child in need. I don’t think that it has progressed that far in this country yet, but the person who co-ordinates each area for the Linus quilts she finds out who needs them. They go to underprivileged schools, to schools with underprivileged children, they go to hospitals, they go to children’s homes and they’re always, they’re a gift, anonymous gifts. We don’t put our names on what we’ve made but we have a special little label which we tack on to say ‘Made with tender loving care for Project Linus’. And these quilts are then given to these children. BT: That’s lovely Gwen. I know that you love going to other quilt shows so what do you look for and notice in other quilts? GJ: Ideas to make for myself, workmanship. I love looking at other people’s appliqué quilts. I would never have the patience or the skill to make one of my own but there are some, you go into an exhibition sometimes and you walk in through the door and you get this wow factor from one particular quilt or you just look at the whole exhibition and you think, a lot of people have worked very hard here and they’ve got good ideas, simple ideas, but good ideas. One exhibition I went to the other day this quilt was all squares, bigger than the ones I have got in the quilt on my lap. But all the squares were set on point and the difference that that made and it was just a mass of Christmas fabrics. So I came home from there and I started making one like it because I thought it was so easy and yet it looks good. And with something like that you don’t want to spend too much time making a Christmas quilt because it is only out for about five weeks in the year and then it gets put away again until the following year. BT: So you’ve almost said what makes a good quilt but can you clarify in your mind on what makes a good quilt? GJ: The design, the colours that have been used, the workmanship, the neatness and one always wants one’s quilt, if it should be hung anywhere in an exhibition to hang flat and straight and sometimes you see quilts that have got waves in them or don’t hang flat and straight. And it doesn’t matter whether it’s big or small if it’s beautifully worked and neatly finished it’s always attractive I think. BT: So how do you feel about hand and machine quilting. Have you a preference? GJ: I can’t. I mean I can do straight lines in machine quilting, but as for the people like Libby Lehmann who can do anything she likes with a domestic sewing machine, I couldn’t ever hope to achieve that. The most I can do is a curved line from one corner to the other. I’m not very good, if ever I machine quilt something it has to be done in such a way that the lines do not cross each other, because when the lines cross each other I get a pleat on the front of the quilt, never on the back, the back always looks good, but I always seem to get a little pleat on the front of the quilt which is not right, but there’s nothing I can do about it and so as far as quilting is concerned I would prefer hand quilting all quilts. BT: And what do you hand quilt on? GJ: A hoop. I used to have an oval hoop but I didn’t find that very good. I’ve got a couple of round hoops different sizes but I have now got a hoop from America which is called a Barnett’s laptop hoop and it sits on your lap. It’s got a bean bag underneath it, so the whole hoop sits, it’s a sort of 3D hoop, it’s difficult to explain but you’ve got your hoop at the top and then you’ve got support and a base on the hoop and underneath the base you can put a bean bag so the thing sits on your knee. You don’t have to find a table to support the other end of the hoop and you can just get your hand in underneath the quilt and you can quilt away very tidily and nicely. BT: That sounds great. So what do you do with the quilts you’ve made Gwen? GJ: I put them on our bed, I give them as gifts, I’ve given them as Christmas gifts to nieces and nephews, I’ve given… I gave one as a christening present, my grandchildren have all had three or four quilts each and I’ve got six grandchildren. Then they’re over the backs of chairs upstairs and downstairs and they are on the beds and one or two are folded up on the shelf in the box room. BT: And what is your biggest challenge as a quilter today. GJ: My biggest challenge as a quilter today is to get finished all the stuff that is unfinished. My granddaughter has sorted all my unfinished stuff into boxes and she has got six boxes upstairs in my sewing room with ‘finish me’ in big block capital letters and an exclamation mark on the end, written on them. Some will take very little time to finish others then are just still in the block stage where they need to be assembled, layered quilted and bound. So whether I’ve got enough years left to get that done is another matter, but I will try. BT: And why is quiltmaking important in your life? GJ: I think it’s because it’s creative. When I was a child and we used to go and stay with my grandparents, my grandmother had a quilt on her bed, the quilt that was on the bed that my mother and I used to sleep in was… I have now got it. 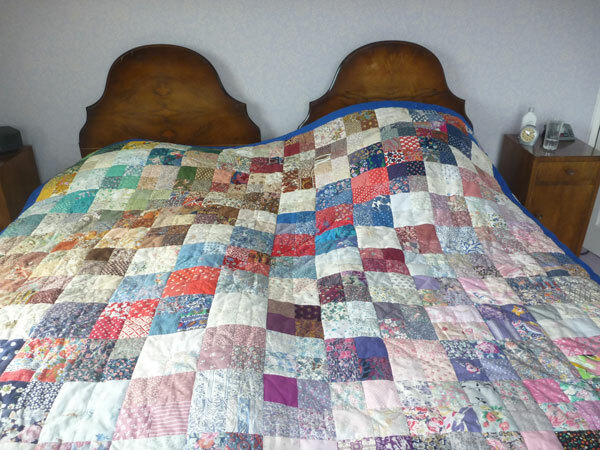 My grandfather had a quilt on his bed and it was so heavy that I often used to wonder how he could sleep under it because, I think, I don’t quite know what’s in it. I have got that, that is in a very bad state of repair and I have got that now and you can feel the weight of it. And I don’t know whether it’s blankets in it but there seems to be more than one thing in it, whereas the other quilt that was on my grandmother’s spare bed there had sheep’s wool in it. You can see it, because there are two places where the one layer, which we think is a Paisley shawl, has started disintegrating and you can… added to which the feel of it and the lighweightness. And… I always used to think of quilts in those days as wholecoth quilts because that’s all the quilts in my grandmother’s house were wholecloth. Now the one thing I am very sorry, sad about really, is that I wasn’t that interested in those days, I was only, what? 11 when my grandmother died, so I never had a chance to ask her whether she had made the quilts or whether, being a farmer’s daughter, and a flourishing farm, she was one of the people who would employ an itinerant quilter to come round and do all that for them. And I don’t know I just thought that one day I want to make a quilt and then all of a sudden it became a patchwork quilt as opposed to a wholecloth quilt and I used to make clothes for my girls and for myself and all the scraps, cotton scraps were saved, every single scrap was saved however big or small. 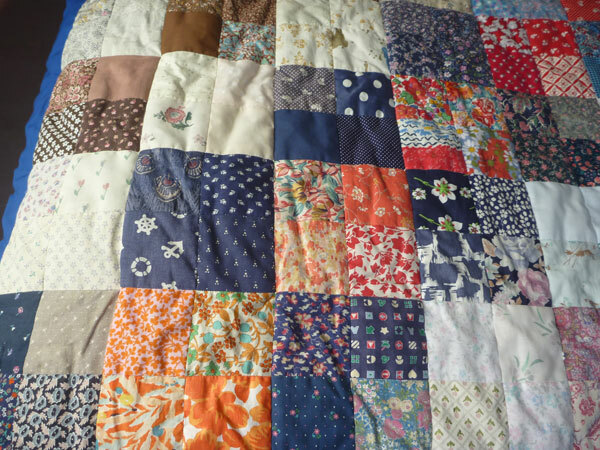 Because one day I was going to make a patchwork quilt and then we moved house and I thought what am I going to do with this and I gave it all away and then I started saving it again and then I gave that away. And when I finally came to finding that there was a group in my locality and joining it, I hadn’t got any scraps left and I had to start again from scratch. I went to America when I had been quilting, what, for… two years and I think that those of who went thought we’d died and gone to heaven because the exchange rate was $2 to the £1 and fabric was something in the region of $3½ to $4 a yard, so as far as we were concerned you could… you could just fill your cases… you saw a pattern and so you immediately went and bought the fabric to go with that pattern and came home with it. BT: How wonderful. If only that was today. GJ: Ohh and every time I go to America now I am tempted to fill my case with fabric but, uh, I have learnt not to now! BT: You’ve used a term called wholecloth quilting. Can you explain what that is? GJ: Well, a wholecloth quilt is a typically Welsh quilt, they are also done a lot up in the Durham area of England where you have one piece of fabric, you do not patch the top, you do not find a pattern and different fabrics and make a patchwork quilt. It is one piece with a front a wadding and a back with quite intricate design quilted onto it and I was told you could… that it was possible to recognise which quilter in the olden days had quilted the quilt because of the designs that had been used. I don’t know whether that is true or not. I’ve never read it in a book, it was only something somebody told me and you were honour bound not to pinch another quilter’s designs. But there again I don’t know if that is true or not. BT: And another term you’ve used is is ‘itinerant quilter’. GJ: Well, way back at the turn of the century and possibly a bit before, some women made their living by travelling from village to village or from farm to farm and the farmer’s wife would provide all the fabric that was necessary and the quilter would sit there and she would make a quilt out of what the farmer’s wife had provided and the farmer’s wife would pay her for her time. Now my aunt, when she was laid up started writing her memoirs, and she said that she remembered her mother, at the turn, in the early, well you know about 1900 at the beginning of the 1900s, paid a local quilter 7/6d for quilting a quilt for her. My grandmother would have provided the fabric, this was a different grandmother, now. BT: I am trying to work out, that’s about 35 pence in real money isn’t it. GJ: Umm… yes, less than 50p anyway. BT: That’s amazing. I remember not so long ago you taking two quilts down to St. Fagan’s and having to put them in the deep freeze. GJ: The reason I was told to put them in the deep freeze was to make quite sure that there weren’t any mites in them, what did she call them? Carpet bugs or something. And that if they were in this particular quilt and this quilt was stored with any other quilt or textiles they could migrate and they would infect everything I had. So, if I put it in the deepfreeze, so if I wrapped it up in a plastic bag and put it in the deep freeze for a fortnight that would kill the little bugs and the quilt would then be safe. So I came home and I did that and then you have to leave it for 24 hours before you unwrap it for it to come back to room temperature and I think, altogether, I put about six if not seven old quilts into my deep freeze, one at a time. Unfortunately instead of having a chest when they could all have gone in together I’ve got one with drawers in it and there was only one drawer big enough. And so I have now debugged all the old quilts that I have. Only one of them is a tidy quilt, the rest are in a terrible state of repair, but I can’t bear to throw them away. BT: And just a last thing. Can you just tell the tape what St Fagan’s is? GJ: St Fagan’s is the National Museum of Wales, down in Cardiff where they store and display all sort of things to do with Welsh life. They have, I’m not sure if they have quilts out on display, but if you ask they will take some of them out and show them to you and that is how come I took this one down to see if somebody could tell me what to do with this particular quilt, because one side of it is very, very badly damaged, but the other side is beautiful. The quilting on it is amazing, it really is amazing. BT: Well, Gwen, thank you for sharing your stories with the Talking Quilts project. That was absolutely brilliant.